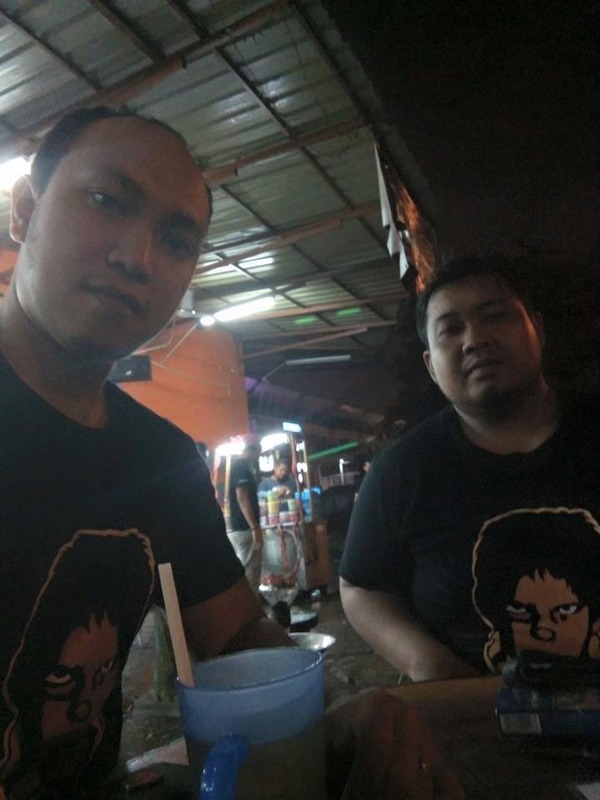 After much criticism with the current state of football in Malaysia and expressing our frustration with the continuous failures and the lack of effort from FAM as the officially footballing body in this country, we still believe that the footballing scene in Malaysia can be saved, provided that we revamp the entire structure of FAM and the future strategy of the organization itself. I believe that there is no need for me to highlight the problems that we are currently facing (both of us have highlighted this here and here) but our point, it is because of the current strategy and administrative action done by FAM is what brought us to this state. Hence, we have taken the initiative to propose what can be done to completely revamp FAM with the current resources that we have at the moment, which we believe would offer a more sustainable and efficient strategy to develop our footballing scene. Any attempt of fixing an problematic organization would first need a review of the performance to date from all the people involved in the organization. With the review of the existing Key Performance Index (PKI) starting from the senior management down to the working level executive, we would then be able to ensure that no "dead weights" exist within the organization. Why we feel that this is crucial is because that having the KPIs within the organization should serve as both the target set for the employees and also should serve as the performance benchmark for all that is involved in the organization within the year. Critical Non Performance - If it is shown that the has been a negligent disregard for the KPIs set (which would usually mean "no targets" or "minimal targets" has been achieved by the individual within the year) is found, therefore a disciplinary action or dismissal from role needs to be done. Unsatisfactory Performance - If there are situations where KPIs are partially met however not completed, it is suggested that the roles and responsibilities of the person in the organization needs to be revisited, together with a reassignment of targets for the individual, with the certainty that the person understands the role that is given to him/her in the organization. Satisfactory Performance - For those that has achieved their targets within the year, a two way dialog between the management and the individual should be done as a "postmortem" to his/her activities for the year and perhaps identify ways to improve, both from what is expected from the individual and also his/her own expectation. After all the review has done, we believe that there is a need to implement a "conduct compliance strategy" which would ensure a transparent practice on all processes done within the organization and a monitoring methodology that would ensure all activities done within the organization are stringently checked at all times. On top of that, we would also suggest that all KPIs set for all the employees needs to be accompanied with a "quarterly roadmap and checkpoints" which will be engaged by their superiors on a quarterly basis. This would ensure that any necessary updates or actions can be taken within the quarter rather than waiting for the end of the year. 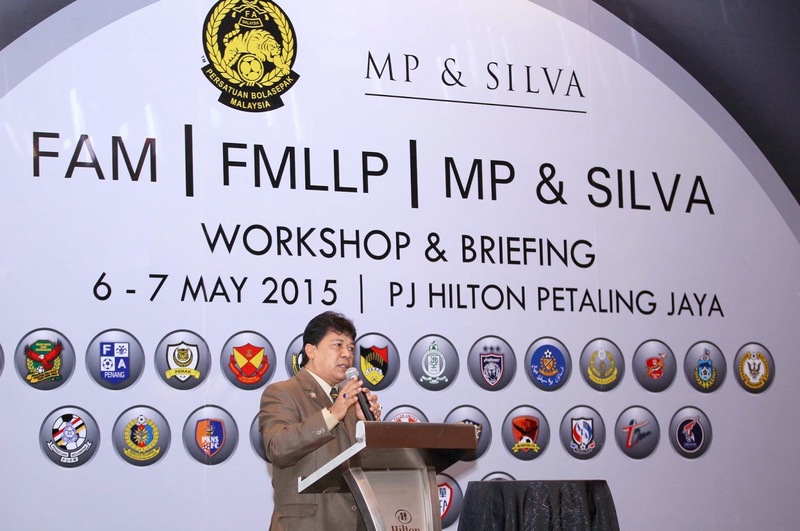 There is a need to revisit again as to what FAM's role in reinventing Malaysia football scene. As to date, there is no clear definition to the public as to what exactly is the role of FAM in developing football in the country, as it is made seem that they have taken ALL THE ROLES from development to executing the leagues in Malaysia. There is a serious need to have the roles of FAM to be defined properly and executing their activities accordingly as well. As the official football governing body in Malaysia, FAM's role should remain as monitoring body in majority of aspects relating to football in Malaysia. However, it has to be defined that FAMs role is to focus in creating viable avenues and strategies on how to develop the game in Malaysia, rather than trying to execute it themselves. The graph above shows a rough suggestion on what the role of FAM should be in developing the standard of football in Malaysia. As it can be seen above, we believe that the focus of talent development should come from other bodies (ie clubs, academies, sport schools, etc) and it is to FAM's responsibility to help facilitate this to make it happen. 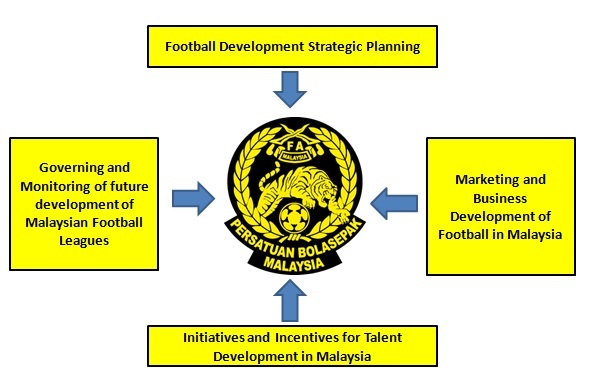 In general, the Football Development Strategic Planning should serve as the basic blueprint of FAM's planning for football development in Malaysia. 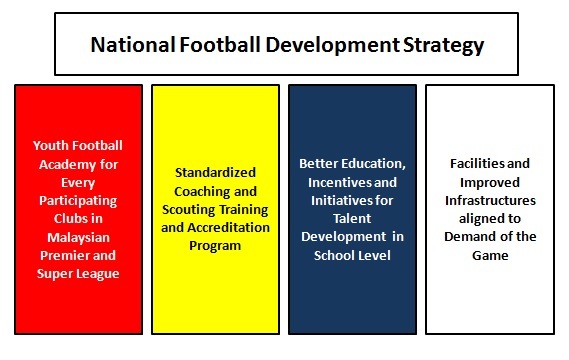 In general, we propose for FAM to follow the following targets under Football Development Strategic Planning. From our discussion, one of the biggest problems we have here is the lack of avenues for young local talents to thrive. Hence, one of the biggest change that needs to be done is to have the clubs take responsibility for the development of youth talent here in Malaysia, as their value add in participating within the M-Leagues. Taking example as how it is done in almost all countries in Europe, we suggest for FAM to initiate and help facilitate a youth development academy for each club that is currently participating in the Malaysian Super League and Premier League. This way, each clubs are given the responsibility to develop young talents within their ranks rather than just pinching young talents from already limited pool of players. This also eliminates another problem that is common in Malaysia, which is the lack of academies of facilities for people outside of urban areas to be spotted. For talents outside of the Klang Valley area, there are currently not many avenues for kids to actually explore and many are still unwilling to be away from their home and families just to play football. If we have each of the clubs creating a formal football academy in each of their clubs, every state in Malaysia would have more than one formally recognized academy to go to and their performance can be monitored by FAM itself. With this, regulations and KPIs for each footballing academy can be set as a mandatory requirement for all participating clubs in the leagues and a review of each of the academies can be set, to ensure the quality that is produced by the clubs is maintained. Standardized Coaching and Scouting with Accreditation Program is quite straight forward, FAMs role should also cover the quality and level of expertise of all the coaches in Malaysia as well as the quality of scouts in Malaysia. We believe the aim here is to continuously improve the level of coaching and scouting with the aim of having a large number of internationally certified coaches in Malaysia. While this would then benefit directly to the clubs that they belong to, it also boosts the level of expertise in our coaching pool as a whole. Finally, Improved Facilities and Infrastructures is something we believe that Malaysia desperately needs in order to improve the level of football in this country. As we have seen new private academies such as the National Football Development Plan (NFPD) and Frenz Academy that are making waves in developing young local talents in the country, FAM should respond the same in creating Regional Center of Excellence for Football especially in regions outside of Kuala Lumpur that takes specialist developmental coaches with nutrition experts that help develop some of the top talents in the country. We have seen the problems with coaches finding difficulties in selecting players due to the dwindling talents in the player pool. Which is why we believe that there is a need for FAM to take their role in developing a more competitive environment within our M-Leagues. 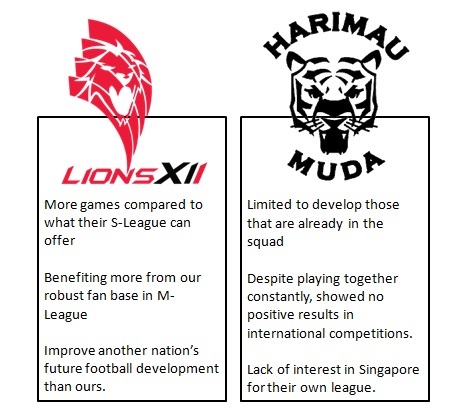 Firstly, we both agree that having Lions XII in the league brings no benefit to us whatsoever and neither does the Harimau Muda program playing in the S-League. With that, FAM needs to make a stand that the M-League should have always been for the Malaysian clubs and member of Harimau Muda would gain better experience if they are incorporated in our clubs rather than a designated team playing in a foreign league, which limits the number of players than you can really develop to the players registered in the team. Next, a better organization of scheduling for tournaments in the M-League is crucial in order to avoid any disruption of the season. We believe that we have seen enough disruptions caused by various reasons this year and FAM should take into considerations all of these possible disruptions (which they could have foreseen) when creating the football calendar for the year. We also believe FAM should be responsible in creating "impact driven" national level friendlies once a month for the national team. Biggest issue that we have is that we need to steer clear of "circus friendlies" and focus on friendlies that can bring proper benefit to the development of our national team. Once again we would like to reiterate that we are not against foreign clubs playing their tours here, but rather have them play with our top clubs rather than our national team. Finally, which we believe is a more important aspect under this category is that there is a need to create more leagues that caters not only to the senior players but also creating leagues for the youth and developmental players. 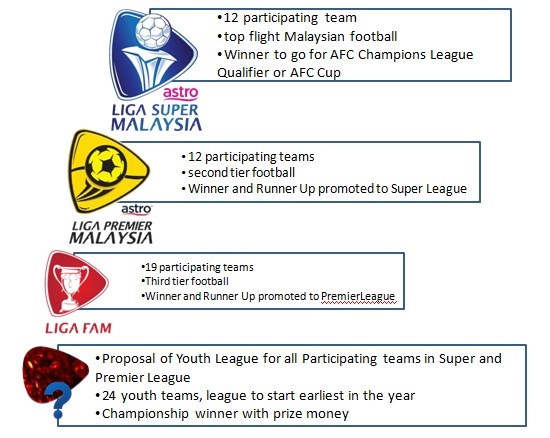 As per mentioned in the earlier proposal, once every club participating in the Super and Premier league has established their own youth academy, FAM can provide a better competitive environment by creating a Youth League for all the youth academies in Malaysia. This way, you can ensure that the youth development in training will get an early competitive exposure in the game as well as creating a very early awareness of potential top talents in the pool that can be referenced in future selections. Facing the reality, monetary incentives goes a long way in the development of a club and it should be different here. Our proposal is that there is a necessity to increase the pocket share of all the participating clubs in the M-League which will then also contribute to the capability of them improving in the near future. While some may argue that in this region, we are already providing a lot as prize money for the clubs but unfortunately, its peanuts compared to what we can really obtain and distribute the wealth accordingly to the clubs. Take for example the profit structure of the English Premier League here. (a) Equal TV Rights of Share - to which every clubs will receive equal funding generated through TV rights and commercial values. (c) Facility Fees - Amount of times your games are shown live are given a portion of the generated income. Which means that even a club like QPR that was recently relegated from the Premier League would still received a total of 64.8 mil Pounds at the end of the season out of 5.18bil Pounds generated from the league, which makes QPR earn 1.25% from the total revenue of the league. While that percentage looks like a small number, imagine the amount that translate to, not inclusive of the amount they have generated on their own through sponsors, merchandise and ticket sales would dwarf what we receive here in Malaysia. FAM should take the initiative to emulate the same methodology of wealth distribution to the clubs participating in our leagues, through proper revenue planning which will be covered later in this article. We propose that FAM also needs to step up their efforts in marketing the league, both domestically and in the international level. In truth, development of football requires large amount of funding and the only way for them to do so it so exploit the opportunities and marketing possibilities that we have with the M-League. We have seen the latest collaboration between FAM and MP & Silva to take up the role of promoting the broadcasting of both the Super and Premier League games from next season onwards, which we are hoping would further boost the viewership of the leagues. On top of that, the role of FAM needs to further push funding by exploring further corporate sponsorship for the league by making the league more attractive for further sponsorship through corporate bodies. The end goal for FAM is to fully develop the potential of expanding the business potential of M-Leagues, beyond even the fan base here in Malaysia. To match the same business principle as most of the successful leagues around the world is to create the awareness, interest and support beyond their own country and we believe that FAM has the necessary tools in promoting the leagues within the ASEAN region. Admit it, FAM's biggest problem is their undeniable ego administrating the sport in this country. One must admit that more things can be achieved when the ideas from different organizations can be shared together with the administration of FAM. As can be seen by the efforts of the Ministry, FAM needs to be more open in communicating their plans and strategy with the Ministry as to ensure that there will always be a "check and balance" with the planning that is implemented by FAM and even share ideas of training and youth development from different bodies in the country. In the end, we believe that both organizations having the same end goal which is to develop the local football to new heights in the future. With that in mind there should be no reason why multiple organizations cannot at least collaborate together in their strategies. Our point here is simple, if two die hard fans of Malaysia football can come up with strategies like this to further revamp and improve FAM as an organization over a long chat and a cup of coffee, surely there must be more that can be done in the ranks of the organization to fix the current rut that we are having. We hope that this article, even though still lacks further ideas, serve as a reminder of the potential that we can reach in our football with the right attitude and strategy that has to first come from the main governing body. We implore that for once, drop the ego and do what needs to be done to fix this.